Ice Cream is no longer just for hot summer days or after break-up gorging – ice cream packaging, and melted, pastel colors, can absolutely inspire rooms. Ice Cream: Ciao Bella Gelato in Malted Milk Ball, “nostalgically crunchy”. Found HERE. / Room: Stacey Sargent, from Of Love and Photographs, lives in a thrift shop, flea market, and budget friendly inspired home. Found HERE. Ice Cream: Starbucks Limited Edition Peppermint Mocha Ice Cream. Found HERE. / Room: Simplicity and color give this room its drama. Asian design elements, and classic English elements mingle. Room by Tracy Murdock Design & Management. Found HERE. Ice Cream: I am a (non recovering) chocoholic! This new Ben & Jerry’s flavor includes chocolate ice cream, chocolate cookie bits, and chocolate pudding swirls. Image found, HERE. 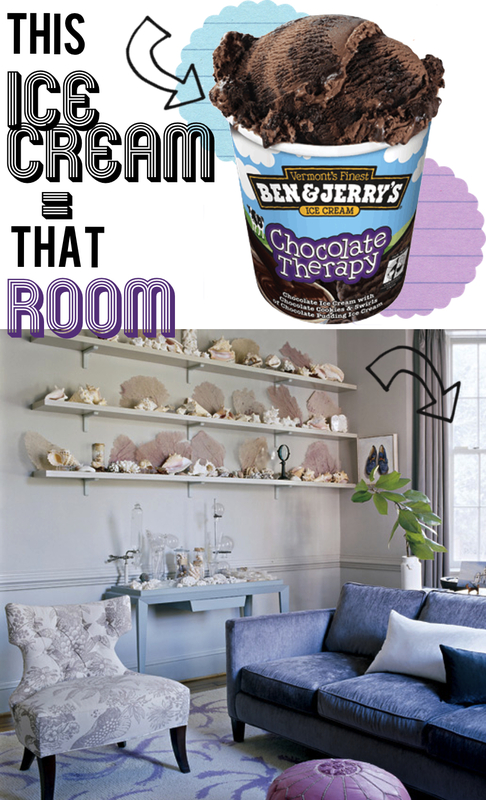 / Room: This Ben & Jerry’s Label is hard to replicate! Its color scheme includes a sky blue, a deep purple, yellows, tans, and a pop of green. 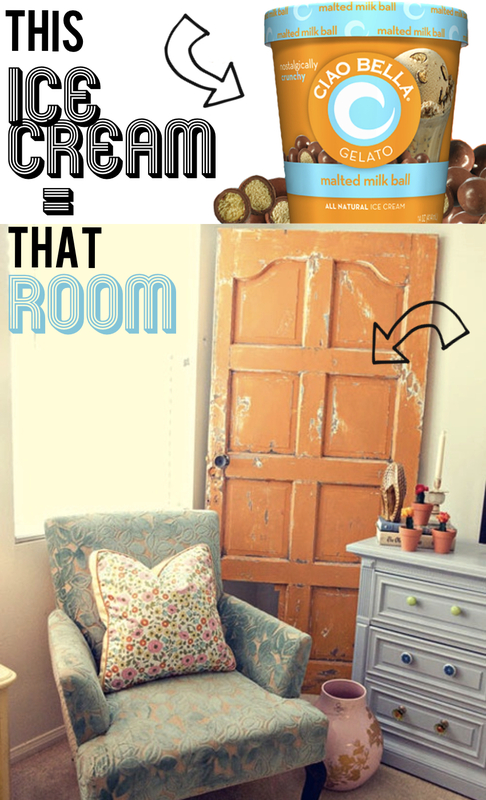 This room includes hints of all the hues of the new Chocolate Therapy flavor, with the airiness of the brand’s cloud scenes (cow not included). From Elle Decors May 2009 issue, the home belongs to Alexandra Wentworth and her husband, news-anchor George Stephanopoulos, situated in Georgetown, Washington, DC. Photographer: Simon Upton. Found HERE. 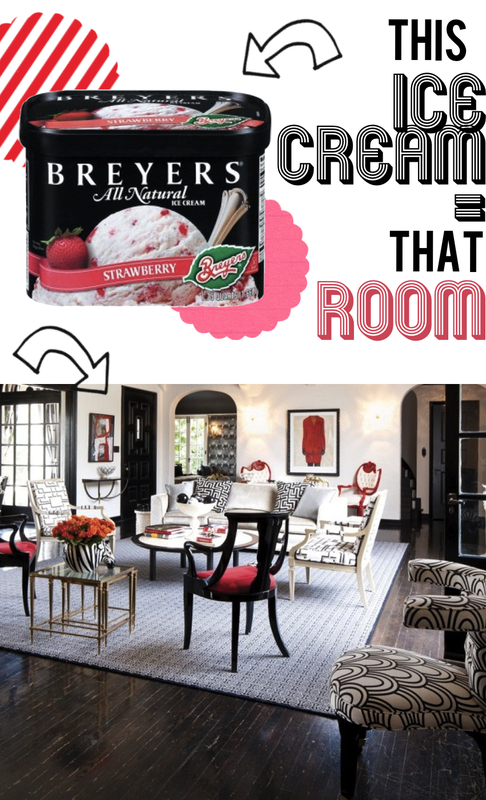 Ice Cream: Breyers Natural Strawberry ice cream. Bursting with sun-ripened strawberry pieces! Although the color is always lovely, strawberry is actually my LEAST favorite flavor. Sorry! Found, HERE. / Room: This grand space is given a bit of whimsy thanks to the bold selection of patterned fabrics. Designed by Tamara Kaye-Honey. Photo by Grey Crawford for California Home + Design. 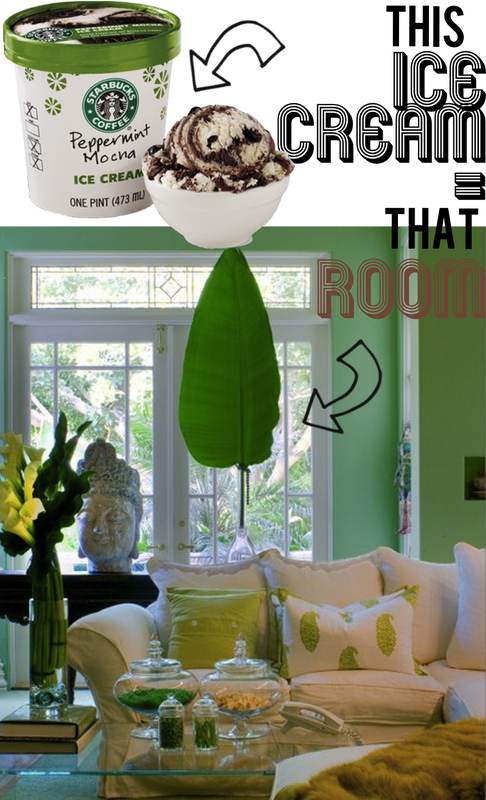 Paint color: “China White,” Benjamin Moore; Trim color: “Black,” Benjamin Moore; Rug: Stark, LA. Image found, HERE.